A new keypad case may be the reason you need to ditch your BlackBerry. Smartphones continue to load on new features, but the choice for buyers often comes down to a simple question: Does it have a physical keypad? This single issue is part of the reason for the BlackBerry line’s continued appeal to business users, and major knock against touchscreen-only input devices. The keyboard has affected more purchasing decisions than buyers would ever admit. 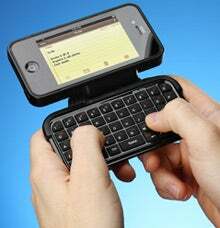 A new iPhone case with a flip-out keyboard may tip the balance in Apple’s favor by offering the best of both worlds. ThinkGeek Inc.’s new TK-421 case is designed for the iPhone 3G S or iPhone 4 and sells for $49.99. Compared with typing on iPhone’s virtual keyboard, the physical one offers faster, more accurate typing and increased productivity. For business users, it means they’ll be able to fire off dozens of emails in less time and with fewer spelling errors and smudges on their phone display. The TK-421 comes in two models -- one for iPhone 3G S and another for iPhone 4. Both are powered by a USB rechargeable battery and connect to the iPhone with Bluetooth wireless, rather than with a dock connector. To access the keyboard, the user simply flips the attachment in or out. The keyboard provides tactile feedback with every button press and a familiar layout, allowing users to type merrily away without having to look at the pad or while carrying on a conversation. Note that some punctuation marks and symbols are oddly placed, however. Users with larger hands are likely to be uncomfortable with the keyboard’s cramped quarters as compared with standard desktop-sized keyboards. Somewhat bulky, it also nearly doubles the pocket space your phone consumes. Another downside is that the TK-421 is not an officially Apple licensed product, so despite the near $50 pricetag, it isn’t necessarily future-proofed against later hardware or software updates. Still, by addressing the most common complaint levied against the iPhone by business users, the TK-421 is an option that many iPhone business users are likely to embrace. What’s surprising is that more such products haven’t yet come along.